These apple chips have so few ingredients, if they had any fewer ingredients, they would not exist. That’s a back-handed way of saying that there’s only one ingredient in these apple chips: apples. 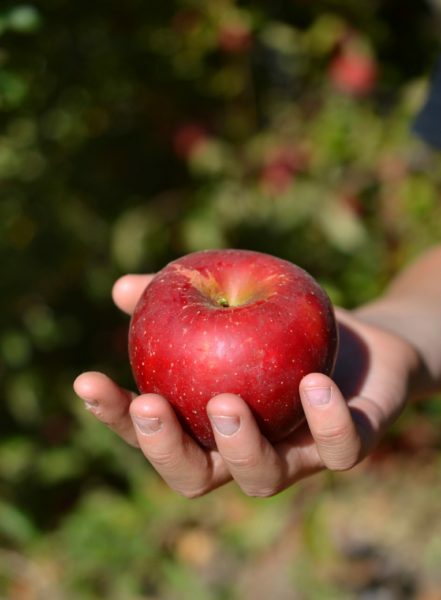 Last weekend, we had a chance to head out to a farm (Riley’s at Los Rios Rancho) and pick a whole bunch of apples, which in our book is one of the greatest joys of fall. We came home perhaps a little apple-heavy with 27 (!!!) pounds of apples. So now we’re obviously looking for ways to burn through these apples, aside from just eating them out of hand. That’s where apple chips come in. They’re super-easy to make, and they’re an addicting, healthy snack. In fact, even though we had an assembly line of kids helping us to make them, we have only a few single chips left to show for our efforts one day later. Back to the chip-making factory, kids! Take each apple and carefully cut the core out of the center so there is a big cylindrical hole running from north to south on the apple. Carefully slide each apple through a mandoline slicer to produce slices that are about ⅛ inch thick. Lay out the slices on parchment paper on a cookie sheet. Bake at 200 degrees for approximately 1 hour, or until apple slices are slightly browned and crispy. Dust with cinnamon if desired. Serve anytime; keep them stored in an airtight container. 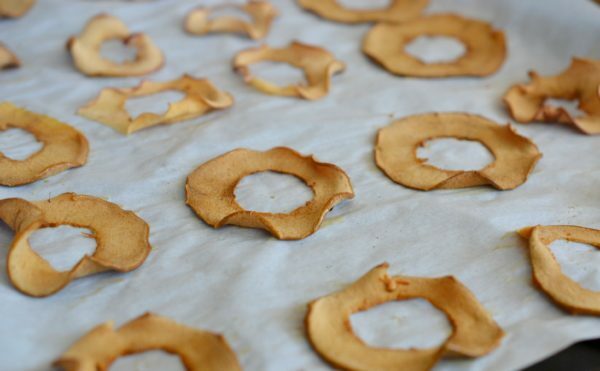 The only tricky part of making apple chips (unless you have an apple corer) is cutting out the core in the center. Some people, of course, make apple chips with the center core intact, but we like it better when you don’t have to eat around the seeds. Carefully slicing out a core from the center with a sharp knife should do the trick. The good thing is, it doesn’t matter if your work isn’t perfect. 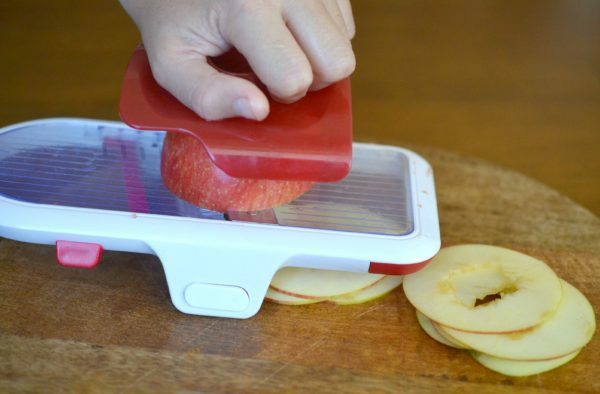 After your apple is cored, make thin slices with the mandoline slicer. Then lay them out one by one on a cookie sheet and bake them at a low temp until crispy, about 1 hour. 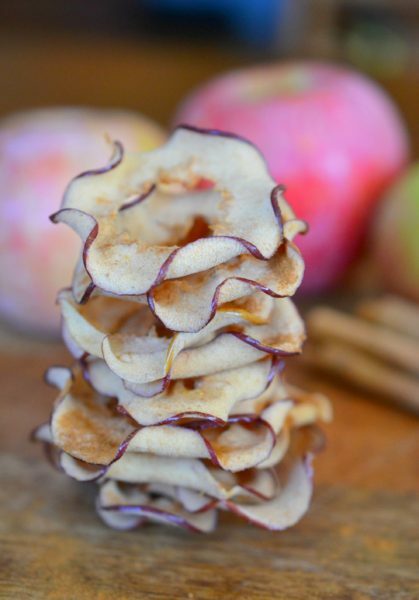 These apple chips are super-tasty by themselves but they’re also delicious with a little cinnamon sprinkled on top. You can store them in an airtight container if you like, but in our house they don’t last long enough for that. 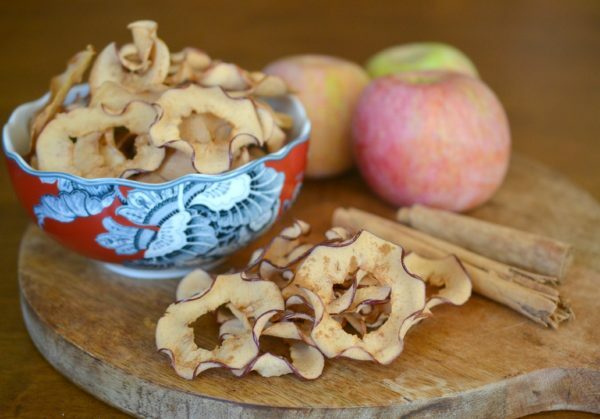 One last thing – they’ll work well with just about any kind of apple! 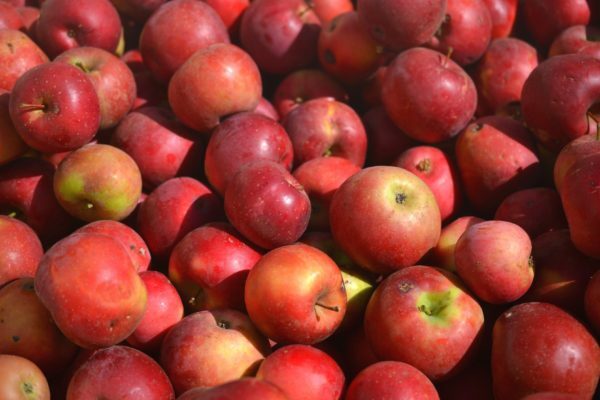 The fresher the better, of course… and if you can get them fresh from the farm, you’ll be in true apple heaven.